If you have not yet run a report to drill into, please visit the Select Report Settings help page. 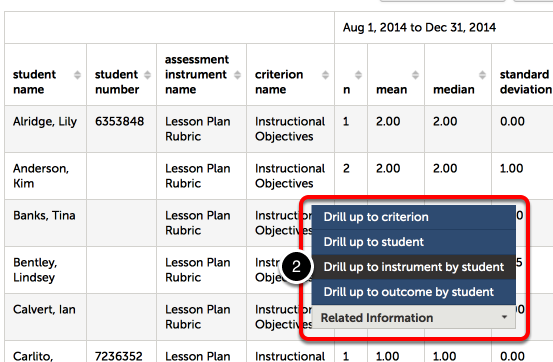 Related Information: View Instrument, View Instrument Linkages, Assessments for Instrument, Instrument Criterion Scores by Student/Date, Instrument Criterion Scores by Student (Matrix), Instrument Criterion Scores by Department (Matrix) and Drill into allocations. If you would like to include the name of the assessor and comments in your report, select the Instrument Criterion Scores by Student/Date option. Next, click adjust the Report Settings option to select to include these options. For full instructions, please visit the Assessment Instrument Report with Assessor Comments help page. 2. You can continue to drill down and/or up into your results by clicking on the report results and selecting from the menu options. How do I renew a user? How can I check to see if a code has been used? How do I create a new department? How do I link an assessment instrument to a table of contents?